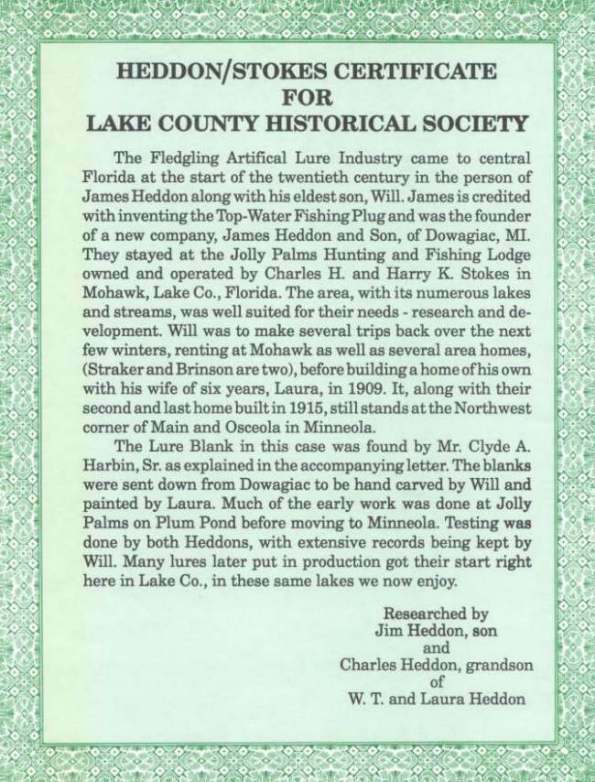 W. T. and Laura Heddon Lure Blank History - It started on June 9, 1986 when Mr. Clyde A. Harbin Sr. departed from his home in Memphis, Tennessee headed for Minneola, Florida. Mr. Harbin's goal was to travel to Florida and obtain information about the Heddon/Stokes Family Heritage from remaining family members of the Heddon and Stokes families. Mr. Harbin drove into Minneola, Florida just before noon on June 10, 1986. 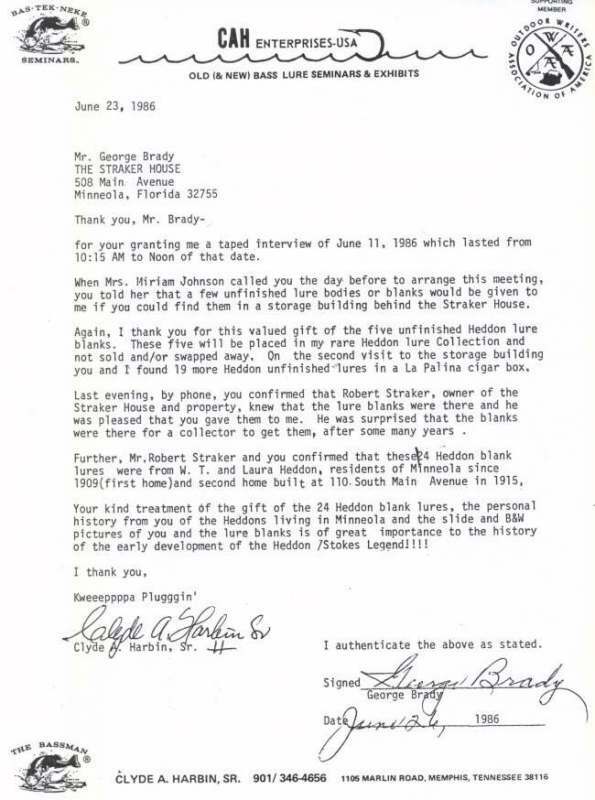 While interviewing Mrs. Johnson that day she called George Brady and scheduled an interview for Mr. Harbin with him. Mr. Harbin interviewed George Brady at the Straker House which is located at 508 Main Street in Minneola. Mr. Brady gave Mr. Harbin five unfinished Heddon lure bodies that he found in a storage shed behind the Straker house. These lure blank were sent down from Dowagiac which W. T. Heddon would carve and Laura Heddon would do the painting. 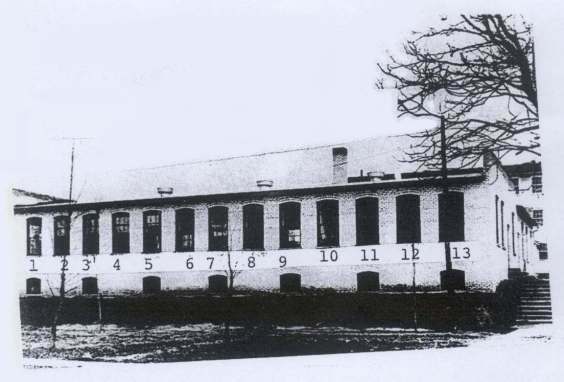 Mr. Harbin suggested that they make a second visit to the storage building and while doing so they found a La Palina Cigar box which contained nineteen more unfinished lure bodies. It was in 1909 when W. T. and Laura Heddon built a home in Minneola. After they moved to Minneola they no longer had the use of the Jolly Palms Resort Boat House. They now rented a work shop that was on the Straker property. 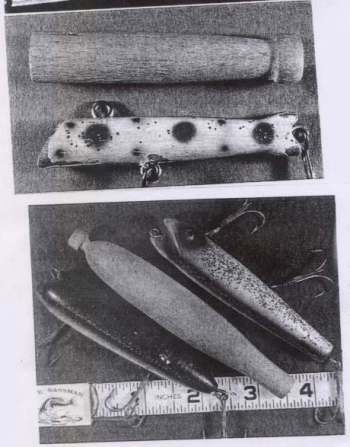 W. T. and Laura Heddon now designed and made their experimental lures in the Straker work shop. The below unfinished gift lure body is the same as the red X blank in the above La Palina Cigar Box. George Brady made the La Palina box with 19 blanks a gift to Mr. Harbin. Note the 15 amp Buss fuse in the La Palina box. Mr. Harbin believes because of this low amperage fuse that W T. and Laura Heddon didn't do heavy duty work in the Straker work shop. The La Palina Cigar Box Blank Lure is the 9/10/01 gift to Floyd Roberts from Mr. Clyde Harbin Sr. 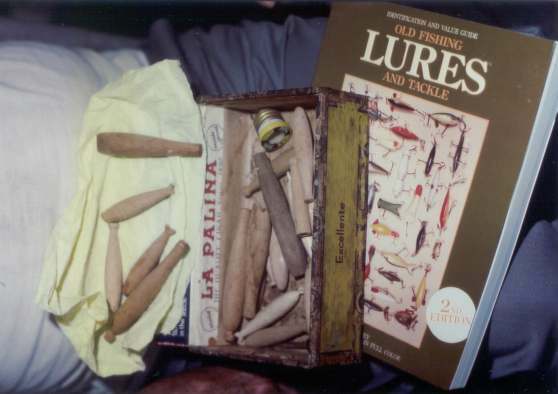 These Blank Lure Bodies were in the La Palina Cigar Box that was found on the Straker property. This is one of the small blank bodies and an un-catalogued Heddon lure. Some of the bodies had Heddon stenciled on the body. The left lure is a early style #6600 Heddon Darting Zara, No Eyes, Wood body. The right lure is a later style #6600 with Glass Eyes, Wood body. Both styles were made from the Middle Wood Blank ---- Brady/Straker Storage House find. The color photograph was taken June 11, 1986 at the Straker House. The wood blank lures are shown just as they came out of the Straker house storage shed. The copy of the 2nd Edition of Old Fishing Lures and Tackle book was a gift for George Brady from Clyde Harbin. 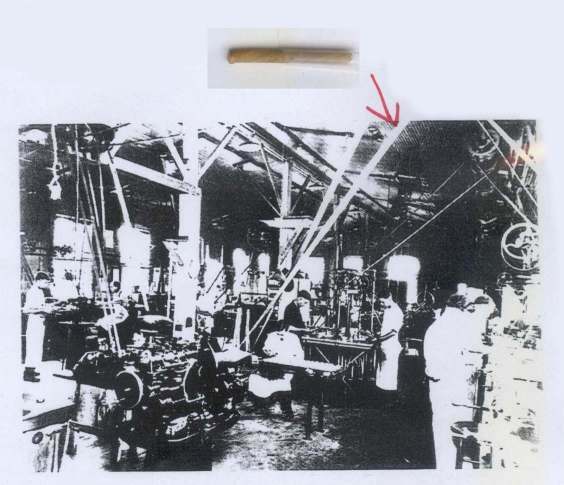 Phillip Stahl, owner of Stahl's Gun Shop in Dowagiac, Michigan identified various departments in the James Heddon's Sons Factory in Dowagiac for Mr. Harbin. In 1927 Phillip Stahl went to work for the Heddon company in the reel manufacturing department. The Reel Manufacturing Section were windows 5 thru window 10. The Reel Assembly Section were windows 11 thru window 13. All of the reels were locked up in a safe at the end of every work day. Shown in the below photograph is a one inch piece Rawhide Leather "Round Keeper" that came from a eight inch piece which was found in the La Palina Cigar Box in the Straker House Storage Shed in 1986. 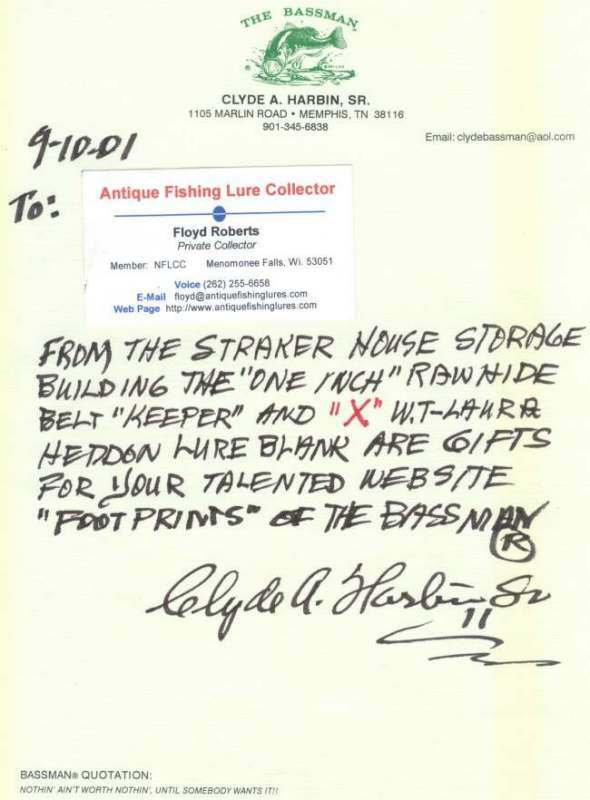 Mr. Harbin also gave the "Keeper" as a gift to Floyd Roberts on 9/10/01. The lathes and machinery in the reel manufacturing section are powered by leather belts that are driven by a 15 H. P. electric motor. Notice the belts running from overhead line shafts and drive pulleys. 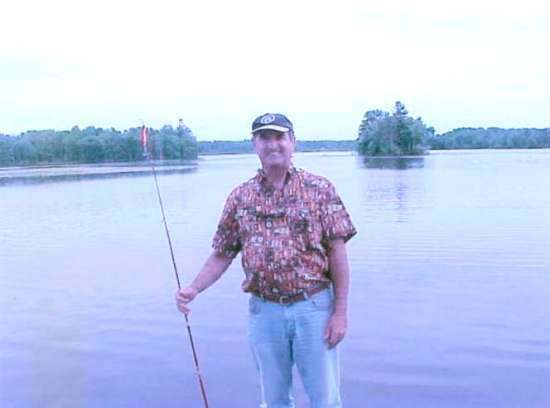 On June 12, 2001 Dan Basore traveled to Wisconsin and visited the city of Chetek, Potato Lake and the Calhoun Memorial Museum in Chetek, Wisconsin. Dan armed with his copy of Heddon Historical Footprints book (#172) was trying to locate W. T. and Laura Heddon's footprints that they left in Chetek, Wisconsin. Dan discovered that he could not locate one person that had prior knowledge of W. T. and Laura Heddon being in their city. 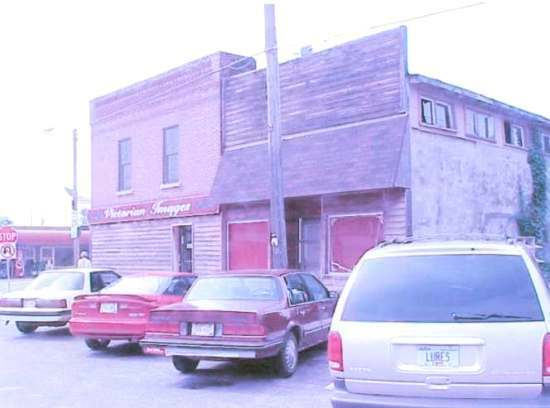 Mr. Basore was successful in finding the Southworth building on Knapp Street in Chetek where the Heddon company had a rod and lure factory that was in operation before January of 1907. Upon Dan's return back home in Warrenville, Illinois he contacted Mr. Harbin and alerted him of his Chetek discovery. It was Dan Basore's Chetek discovery that propagated Mr. Harbin to donate a copy of his Heddon Historical Footprints book and to make other donations such as several modern Heddon replica lures, forty documented footprint pages of W. T. and Laura Heddon 1903 Mohawk to Chetek travels and a Lure Blank Body from the Straker house storage shed to the Calhoun Memorial Museum in Chetek, Wisconsin. Dan Basore and Mr. Harbin have enjoyed a long term friendship and continued fellowship of lure collecting and lure history. Many years ago Dan Basore traded Clyde Harbin the "Missing Link" Heddon Underwater lure that spans the gap between the 1902-1903 underwater lures to the 1905 #100 Minnows. Floyd Roberts (Author of Antique Fishing Lures) plans to visit the Calhoun Memorial Museum in the future to donate a Heddon lure and view the newly added Heddon lures and material that Mr. Harbin so generously donated to the museum. Mr. Roberts plans to do individual interviews and report if any Chetek towns people have come forward with additional Heddon/Chetek information since Dan Basore's June 12, 2001 discovery and now that Mr. Harbin has left Footprints and planted a seed in the Calhoun Memorial Museum in Chetek, Wisconsin.